15 January 1904: born in Tôkyô in the district of Tsukiji. April 1910: he makes his first stage appearance, at the Kabukiza, where he receives the name of Ichimura Takematsu IV and plays the role of Ushiwakamaru in the drama "Kuramayama". January 1922: Takematsu becomes nadai. January 1925: Ichimura Takematsu IV takes the name of Ichimura Kakitsu VII. February 1934: premiere at the Kabukiza of "Ôishi Saigo no Ichinichi", the tenth and last play of Mayama Seika's cycle "Genroku Chûshingura"; Kakitsu plays the role of Yada Gorôemon [casting]. May 1936: revival of "Nanatsu Men" at the Kabukiza; Kakitsu plays the role of Yoshida no Shôshô, in reality the priest Seigen [casting]. 6 May 1945: his father Ichimura Uzaemon XV dies. February 1946: Ichimura Kakitsu VII and Ichimura Matasaburô II take the respective names of Ichimura Uzaemon XVI and Ichimura Kakitsu VIII at the Tôkyô Gekijô. December 1949: Chikamatsu Monzaemon's drama "Ikutama Shinjû" is revived at the Mitsukoshi Gekijô, using a new script written by Uno Nobuo; Uzaemon plays the role of Oriku [more details]. 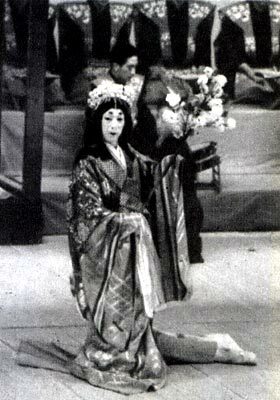 July 1951: revival at the Shinbashi Enbujô of Kawatake Mokuami's drama "Jitsugetsusei Kyôwa Seidan"; Uzaemon plays the role of the okujochû Takekawa, in reality Kôjûrô's sister Otsuta [casting]. July 1952: premiere at the Kabukiza of Hôjô Hideji's drama "Kitsune to Fuefuki"; Uzaemon plays the role of Hideto [casting]. He also plays the roles of Sankatsu and Imada Manjirô in the dramas "Sakaya" and "Ise Ondo". This is his last appearance on stage. 2 October 1952: Uzaemon dies. Ichimura Uzaemon XVI was a onnagata and nimaime actor, who enjoyed performing in an old-fashioned style some famous Kabuki roles like Shizuka Gozen in the dance "Yoshinoyama". He unfortunately died too young, at the age of 48.